KOKOMO, Ind. – In the span of six hours last Saturday, three Howard County schools hoisted IHSAA championship trophies on three different soccer pitches. The day started when Western earned a girls title before the Western boys and Eastern boys raised title trophies that evening. 2A Mississinewa Girls Soccer Sectional: No. 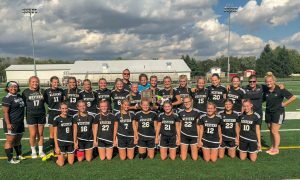 15 Western (16-1-1) girls captured its second consecutive sectional championship with a 4-2 victory over Marion, marking the first back-to-back titles for the Lady Panthers. Sophie Weigt scored two first-half goals – the second with 10 seconds left in the half – to put the Lady Panthers up 3-1 at the break. Samantha Garber put the game away with a goal in the 76th minute to put the Panthers up 4-2. Goalie Madlyn Beechy then defended goal to preserve the win. 2A Northwestern Boys Soccer Sectional: In a thrill on the turf at Northwestern, Western (12-4-1) won the sectional 2-1 over the host Purple Tigers. Mason Pfefferkorn gave Northwestern a 1-0 halftime lead. In the second half, Nate Tuchscherer found Max Harbaugh twice – in the 53rd and 56th minute – to take a 2-1 advantage. Adam Barber recorded the win in goal for the Panthers. Northwestern finished the season 9-8-1. 1A Taylor Boys Soccer Sectional: For the Eastern Comets, it was an easy victory as they topped Liberty Christian 7-0 for its third sectional championship in five seasons. No. 20 Eastern (16-3) led 4-0 at halftime and cruised in the second half. Comets all-time goal leader Lance VanMatre scored four times to bring his record to 101 goals. Joe Hawes added a pair of goals and Luke Swartzendruber added one. Assists went to Seth Lamb (2), Hawes, Jared Smith and Lucas Stout. 3A Kokomo Girls Soccer Sectional: The Kokomo Lady Wildkats advanced to its own sectional final before losing to conference rival Harrison 4-0. Kokomo, which never threatened the Harrison goalie, finished the season 3-9-1 after upsetting Logansport in the semifinals. This entry was posted in Eastern, IHSAA, Western. Bookmark the permalink.